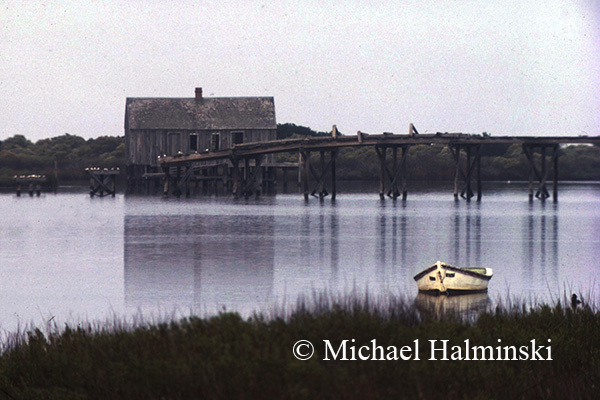 One of the first places I explored on Hatteras Island was New Inlet on Pea Island. The old remnant bridge that’s still there, was built after the storm of ’33 cut an inlet from sound to sea. As a result, traffic was interrupted on the sand road, so the state began construction of a bridge to span the troubled spot. The new inlet filled back in on it’s own, and the state halted construction before it was completed. I used to walk out precariously on that deteriorating, unfinished bridge to catch hard crabs on baited strings. It wasn’t uncommon to come home with a few dozen nice ones. Since then, New Inlet has always brought me a feeling of wonder and tranquility. I wasn’t the first one to get enjoyment there. 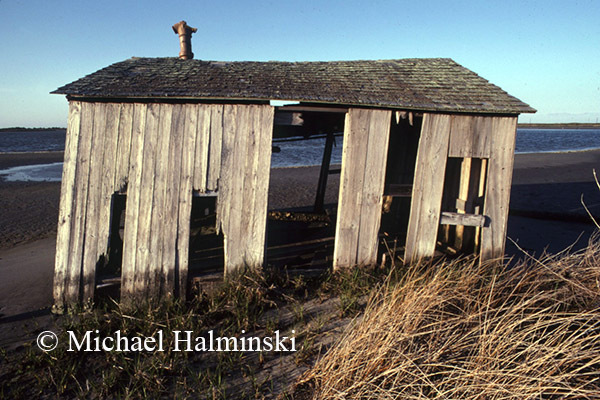 Long before, there were fish camps where locals could hunt and fish for sustenance. It must have been a beautiful, bountiful outpost. One of the first photographs that I made at New Inlet was taken in 1979 as I was testing a brand new 400mm Novoflex lens for the first time. I parked my truck on the shoulder of highway 12, stood in the bed and made 4 handheld, identical exposures to see how the lens worked. 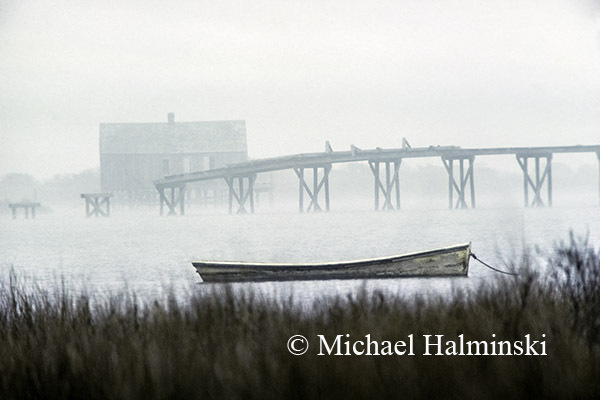 The shot later became a somewhat iconic image as the cover of Hatteras Journal, written by Jan DeBlieu. I took a similar shot in 1982. John Herbert’s sail skiff, once again, served as a crucial element in the composition. 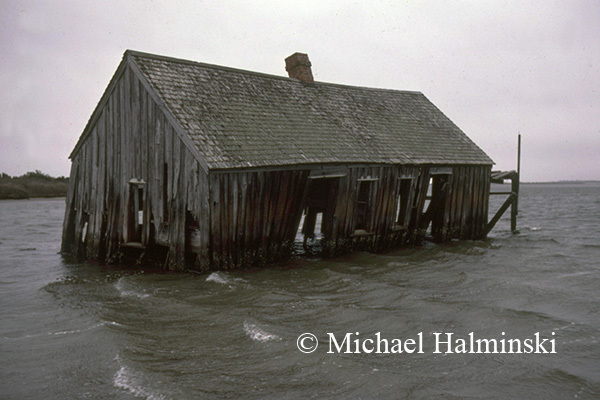 By January of 1985, the fish camp once owned by St. Clair Midgett had dropped from it’s foundation into the water. Later that same year, when Hurricane Gloria blasted through, it took what was left, completely away. In May of 1985, I shot this smaller camp just northwest of St. Clair’s. It too was taken out by Gloria. This entry was posted in buildings, commercial fishing, boat, pamilco sound, gillnetting, history, hunting, inlets and sandbars, Outer Banks on March 4, 2015 by j0jgvm89bj. I still have that photo hanging in our bedroom. If memory serves, we stopped by your place during the family trip to the Outer Banks the summer of 1998. We dropped by and my parents bought it for me as a graduation present. Thanks for sharing other photos from that place and time…neat to see what everything else looked like.